Charmin Schlossman lived in Mexico, mostly at Ajijic on Lake Chapala, from 1942 to 1945, while her first husband Marc Levy (they married in 1939) was on military service during the second world war. In Ajijic, she shared a house with Guadalajara-born artist Ernesto Butterlin (better known as “Lin”) and renowned surrealist painter Sylvia Fein. While in Mexico, Schlossman exchanged correspondence with Frida Kahlo. 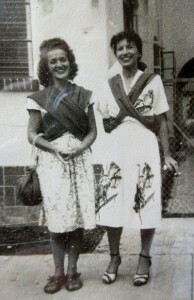 Sylvia Fein (l) and Charmin Schlossman, Mexico City, ca 1944. Photo courtesy of Sylvia Fein. Charmin Schlossman was born 24 October 1917 in Waukesha, Wisconsin and attended Riverside High School in Milwaukee, Wisconsin. She then studied at the Community College in Milwaukee (1935–36), the University of Wisconsin (1936–37) and the Chicago Art Institute (1938–39) prior to living in Mexico. 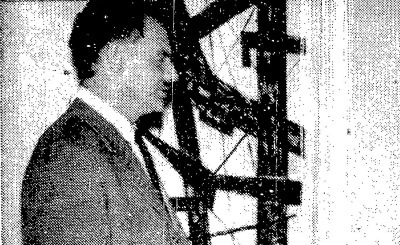 Schlossman initially visited Mexico on a tour, but remained there for several years. A chance meeting in Mexico City with fellow Wisconsin artist Sylvia Fein, who had attended the same high school, led to the two women living in Ajijic. From 1946 to 1947, Schlossman traveled in Central and South America, collecting and studying hand-woven fabrics. At about the same time, the Ninth Texas General Exhibition, 1947-48, included one of her oil paintings, entitled, “Sunset on the City”, priced in the catalog at $300. Soon afterwards, and now known as Charmin Lanier, she took summer classes (1950 and 1951) at the School of Crafts in New Brunswick, Canada. Daughter Danielle Lanier was born in about 1950, and son Christopher two years later. From 1951 to 1957, she was founding president and designer for Charmin Lanier Handwoven Originals, which made custom fabrics for draperies, upholstery, and clothing. Her design work was recognized in 1955 when she attended the International Conference of Design in Helsingborg, Sweden, as the American representative. The fair ran from 10 June to 28 August 1955. Charmin’s daughter, Danielle Lanier Shelley (herself a professional artist) remembers a family trip to Ajijic in about 1958, when her mother introduced her to “Lin” Butterlin and to the Johnsons, an English couple who were long-time permanent residents of Ajijic. Lanier continued to paint, and besides some earlier group exhibits in Mexico, she also exhibited (between 1947 and 1961) at the Kraushaar Galleries (New York), Chicago Art Institute, Houston Museum of Fine Arts, Houston Contemporary Arts Museum (which she co-founded), New Orleans National Exhibition, and Texas State National Exhibitions. The Contemporary Arts Museum, Houston, was established in 1948 to showcase new art and to document its role in modern life through exhibitions, lectures and other activities. 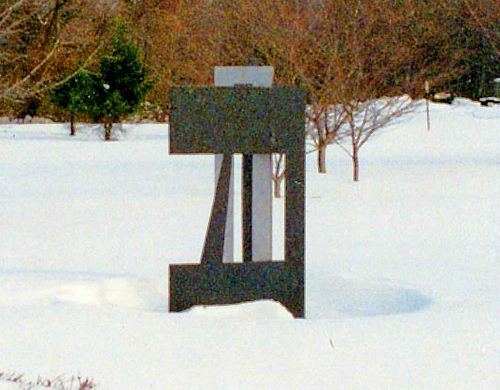 Lanier had works added to the Museum’s Rental Collection in 1956 and 1957. Lanier completed a formal art education degree at the University of Houston (1957–59) and started an art teaching career with a spell in the Houston Public Schools (1958–61). The Laniers then moved to California, where Charmin continued her art teaching career at the Palo Alto School District (1964–69) and the San Diego Community College District (1973–74). After she met and married David Knock in 1974, she retired from art teaching to dedicate herself full time to painting. In the mid-1970s, she exhibited at the rental gallery of the Museum of Contemporary Art, La Jolla. Lanier had begun painting in what she referred to as her “hard-edge realism” style in 1954. Her son, Christopher Lanier, says proudly that “Charmin loved striking, vibrant colors and chose to paint only beauty. She said, “there’s enough ugliness in this world–I don’t have to immortalize it.”” She was largely self-taught in this style, and completed about 400 “hard edge realism” paintings between the mid-1960s and 1993, when ill health meant she could no longer continue to paint. Charmin Lanier Knock passed away on 23 January 2002. In her memory, husband David Knock established the Charmin and David Knock Grove as a permanent memorial in the Navarro River Redwoods State Park, near Fort Bragg, north of San Francisco. Her early experiences living in Ajijic on Lake Chapala, led Charmin Schlossman (later Charmin Levy, Charmin Lanier and Charmin Knock, as well as S. L. Charmin, Charmin S. Levy, Charmin Lanier Knock, and other variants) to lead a rich and expressive artistic life. My sincere thanks to Charmin’s husband David Knock, daughter Danielle Lanier, and son Christopher Lanier, for generously sharing invaluable information about Charmin’s personal and artistic life, via emails. (March 2015). This is an expanded and updated version of a post from 22 March 2012.